If history is anything to go by, expect 2011 Women’s World Cup winner Homare Sawa to be collecting her second Ballon d’Or prize this time next year. At the World Cup, Sawa also won the tournament best player and top scorer trophies. 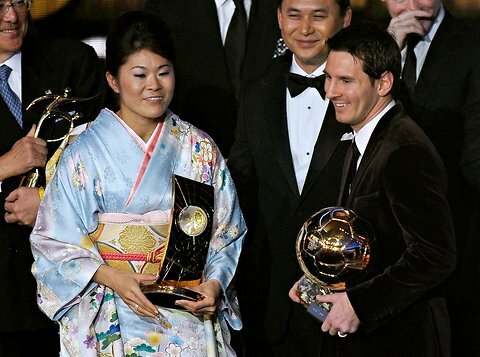 Japanese midfielder Sawa is only the fourth woman to win the award, inaugurated in 2001, because curiously no woman has never won simply once, not to mention consecutively. Mia Hamm won the first two, in 2001 and 2002. Germany’s Birgit Prinz then carried home three between 2003 and 2005, before Marta’s five brought us to the current day. Marta and American striker Abby Wambach were the other two finalists for the award. 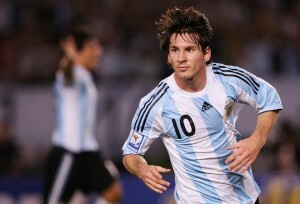 Oh yeah, and Messi won his third. In a row. Sure, Copa América has Messi, Forlán, and Neymar. Yes, it will be a very interesting test for Mano Menezes. Yeah, it’s nice to see the young Brazilian and Argie talent that’s been shining in leagues around the world. And I’ll grant you that, despite lackluster performances from Brazil in its first game and Argentina in its first two, there are good reasons to expect both to put on an offensive show in this Copa America. Both Brazil and Argentina are using very offensive schemes, and both have players who can make things happen. Plus the third traditional power in South American soccer, Uruguay, has a pretty good team, the one that went farthest in the last World Cup and the one with the best player from that tournament. And we can’t forget Chile or Colômbia, both of which bring some interesting players. There are lots of reasons to watch this Copa America. But the best goal you will see this week has nothing to do with the umpteen forwards on Argentina’s roster or the other offensive stars playing in Copa America. It’s from the Women’s World Cup, up in Germany where it’s warm (it feels weird writing that). Specifically, from the Brazil-Brazil… er… Equatorial Guinea – Brazil (about 2/3 of the EqG players on the field were Brazilians) game played yesterday. Not surprisingly in a game between two teams with Brazilian players, this goal was scored by a Brazilian. It was a real Brazilian Brazilian wearing Brazil’s colors. Oh, OK, you say. It must be Marta. Just watch what Erika does to score the first goal. Then watch it again and marvel at how natural she looks doing this unbelievably difficult thing PERFECTLY without having time to plan or prepare for it. Oh. Mah. Gahd. If anyone beats that at all in either of these tournaments, it’s likely to be Marta, but I doubt even she will do it. She was involved in both of the other goals in the EQG-BRA game, both scored by Cristiane. She had a nice assist on the second goal and was fouled in the area, leading to the third on the PK. She let Cristiane, who hadn’t scored in the tournament before the second goal in this game, take the PK and get to two goals. If I understood correctly, if Marta had taken it and scored, she would have become the all-time highest goal scorer in WWCs, like Ronaldo is in the men’s version. I guess she figures she’ll still have time to get there. Rivalries are a really, really important part of the fun of soccer and many other sports. Rival players are special, not quite in the same way as players for our favorite teams, but still special. We’re likely to remember even relatively forgettable players who participated in one or more important games we remember, or even associate the name of a player with memories of the time when he or she played for a rival team. Yes, I did. And I will have a lot more to say about women’s soccer in this post and in the future.